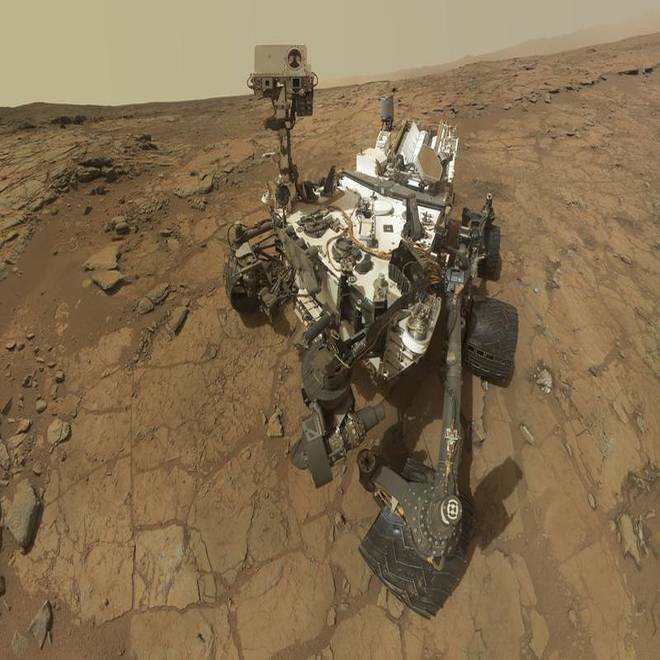 Self-portrait of the rover Curiosity, combining dozens of exposures taken by the rover's Mars Hand Lens Imager (MAHLI) during the 177th Martian day, or sol, is seen in this February 3, 2013 NASA image. CAPE CANAVERAL, Florida — A computer glitch, possibly caused by radiation, has put on hold the Mars rover Curiosity's first attempt to analyze powder from inside an ancient rock, officials said on Monday. Engineers said they hope the NASA rover can resume limited science operations this week. "I don't expect there to be any long-term impact," project manager Richard Cook told Reuters. But "it's probably too early to tell." The $2.5 billion robotic geology station was in the middle of analyzing its first samples drilled out from the interior of a rock when its primary computer developed a problem on Wednesday. The craft transmitted the results of four onboard laboratory tests to ground controllers before science operations were suspended, Cook said. The rover landed inside the Gale Crater impact basin, located near the Martian equator, on Aug. 6, 2012, for a two-year mission to see if the planet most like Earth in the solar system has or ever had the chemistry and conditions to support microbial life. Engineers over the weekend switched the rover to its identical backup computer system. On Monday Curiosity was beginning to emerge from the shutdown of all but essential systems following the electronic brain transplant. Meanwhile, troubleshooting on the faulty computer system is under way. "We plan to do a couple of more checkouts on the original computer, probably on Wednesday," Cook said. The problem is in a flash memory system and may have been the result of a radiation hit, he added. "If I were to guess the most likely cause, that would be it," Cook said. Engineers want to restore Curiosity's damaged computer system so that it can be returned to service as a backup. The rover had been using its A-side computer system since before landing. The B-side system, now in operation, was last used during Curiosity's nine-month cruise from Earth to Mars. Results of the rover's chemical analysis of the rock sample remain set for release on March 12, lead scientist John Grotzinger wrote in an email to Reuters. Scientists chose the rock in part because it is shot through with what appear to be minerals that form in the presence of water. Water is believed to be necessary for life.